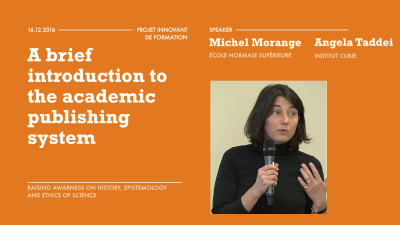 This training course, conducted by the Institut Curie and the Ecole Normale Supérieure (ENS) as part of the “SPIF Doc” 2016 call for tenders, combining philosophical reflection, historical studies and discussions on the ethical issues of scientific knowledge, has become indispensable to all those who will work tomorrow in research or, more generally, in all the professions related to it. It will enable them not only to improve their research approach but also to develop a civic conscience on these issues, and to be better prepared for dialogue with the Society. This module, aiming to better understand the nature of scientific knowledge, to appreciate their place in our societies, and to discern ethical issues related to both the development of this knowledge and its application, took place from November 4th, 2016 to June 23rd, 2017. Paris Science & Letters university endeavors to preserve the privacy and the right to the image of participants in the audiovisual recording of the training modules in strict compliance with the regulations in force. Thus, the speakers gave their agreement to the broadcasting of their intervention as “online trainings”. Participants, on the other hand, may appear in an accidental, anonymous, group and distant way. Any interactions with speakers are only broadcasted when they have prior authorization. These provisions are recalled and accepted upon registration for the training module. If, however, in any of these programs you observe a sequence which seems to contravene these provisions, please let us know, by mail to college-doctoral@univ-psl.fr, specifying the exact location of this sequence in order to facilitate its editing. Corrections will be made as soon as possible and notified to you. Does science help medicine to improve? Vassili Soumelis begins his lecture by surprisingly claiming that medicine is not a scientific activity but an empirical art. However, he says, science has helped medicine become more efficient throughout history, especially statistics, chemistry and biology. 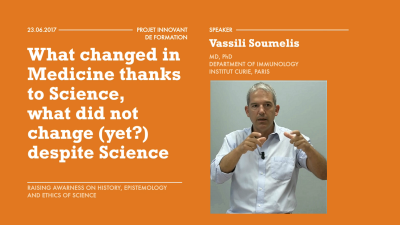 For each of these sciences, Soumelis exposes examples where medicine improved thanks to scientific knowledge. He concludes his presentation with the historical example of tobacco, first developed as a therapeutic substance and later considered as dangerous to one’s health. What was the predominant scientific and political ideology in Nazi Germany? How was science conducted under Hitler? Are German scientists responsible for the Holocaust? 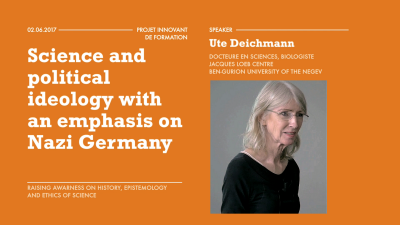 In her lecture, Ute Deichmann answers these questions in detail. She begins her talk by recalling the definition of ideology and explaining it in the context of Nazi Germany. She then talks about the eviction of Jewish scientists under Hitler and the ideological transformation of science in universities and laboratories at the time. She tells the audience about the specific topic of race hygiene and euthanasia in Nazi Germany before finishing her talk by explaining the Nazi viewpoint on ecology and environmental medicine. 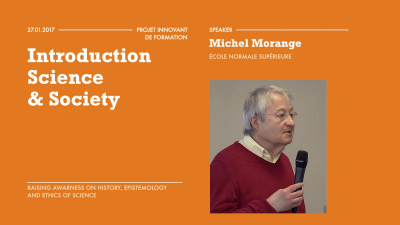 In his introduction to Jean-Pierre Changeux’s lecture on the link between neuroscience and art, Michel Morange briefly introduces the neurobiologist. Does a Neuroscience of Art Make Sense ? Does a neuroscience of art make sense? 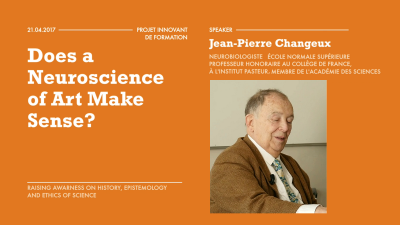 To answer this question, Jean-Pierre Changeux begins his lecture by giving a definition of art and aesthetics. He then explains how the human brain works from a neurologist’s point of view, and details its evolution throughout prehistory. Changeux’s goal is to demonstrate the link between art and cognitive conscience. To do so, he shows the audience how cultural experiences make the brain react. Genes, he says, are 100% responsible for neural development. And so are aesthetic experiences, he ads with humor. Changeux finishes his lecture by claiming that rules exist in art, and he even gives examples of these rules: novelty, surprise, and parsimony. What is ethics? How should ethics influence the way we think and act? 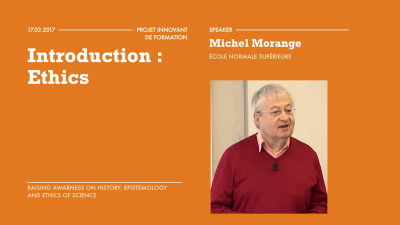 In his introduction to Michèle Leduc’s lecture, Michel Morange uses numerous examples of ethical issues throughout history, from Louis Pasteur to Olivier Voinnet. He recalls the different types of fraud and misconduct in science, and points out the emergence of rules to prevent them. Who tracks fraud and misconduct? How do scientific communities prevent scientists from falsifying their research? 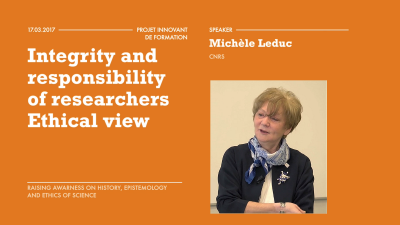 In her lecture, Michèle Leduc starts by introducing COMETS, the French scientific ethical committee she works for. She then talks about the necessity of integrity in science, and lists several examples of misconduct that have been observed amongst scientists. Leduc mentions different ways to prevent such misbehaviors, naming ethical committees, self-examination and control websites. She talks at length about the case of Olivier Voinnet and the consequences of his actions. She concludes her lecture by calling for the responsibility of scientists in their research. Who are scientists? 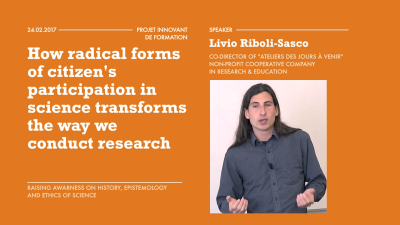 This is the question Michel Morange asks in his introduction to Livio Riboli-Sasco’s lecture. To develop his hypothesis, he first explains what anthropology of science is, and then defines “citizen science”. The problem, he concludes, is the difficulty to distinguish between professional scientists and amateurs. Is science free? Does it have no limits? 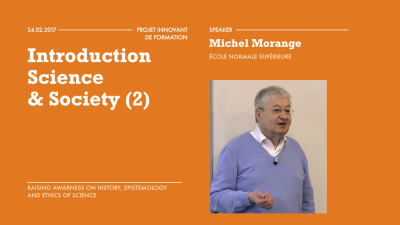 In his introduction to Mathias Girel’s lecture, Michel Morange talks about the role of scientists in their time. He then discusses the relationship between science and political power, as well as the dependence of science upon business. 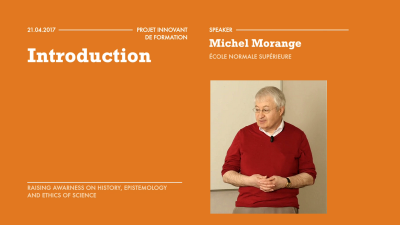 Morange ends his introduction by presenting Mathias Girel, professor of Philosophy at the École normale supérieure de Paris. How to face doubt-mongers? Can we use what we know of antic skepticism to defeat them? 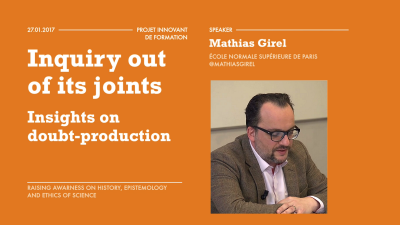 In his lecture “Insights on doubt-production”, Mathias Girel introduces his topic with 4 examples of eye-opening books. He then describes the different techniques doubt-mongers use to weaken scientific findings, and he discloses their strategy to make people believe their arguments. However, Girel explains, understanding of Greek skepticism can help defeat doubt-mongers by debunking their flimsy arguments. He then warns the audience about the risks of always doubting scientific findings and finishes his lecture by giving some tips to help science endure. What are the flaws of the traditional system of publishing research papers? Can we find an alternative way to this traditional system? In his introduction to Brandon Stell’s lecture on PubPeer, a website for centralized post-publication peer review, Michel Morange recalls the fundamentals of the traditional system of publishing research articles in scientific journals. He then gives the floor to Angela Taddei, who speaks of alternative systems of publishing for researchers, and discusses the example of BioRxiv, a preprint server for biology. Can we reduce the flaws in research thanks to a new kind of assessments on papers by the scientific community? In his lecture, Brandon Stell presents PubPeer, the website for centralized post-publication peer review he created in 2012. Inspired by journal club conversations, PubPeer enables scientists to discuss any publication in any field. This platform, Stell says, consequently reduces flaws in research by allowing open discussions and cross-examinations of the material. He then explains how the platform works: how to create an account, how to post comments about an article and how to answer them. He concludes his lecture by announcing the future developments for the platform in order to improve its efficiency. What is common knowledge? How different is it from scientific knowledge? 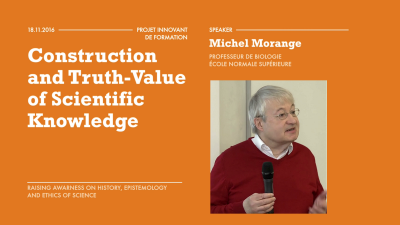 In the first part of his lecture, Michel Morange questions the notion of knowledge and distinguishes it from belief. He also points out a philosophical ideology about the relative value of knowledge and discusses its ability to help scientists reach reality. He then explains in which ways scientific knowledge is different from common knowledge and uses the examples of the Greek philosophers, Louis Pasteur and Karl Popper to support his claim. Scientific knowledge, he says, is a search for natural explanations; it results from a long historical process. Morange ends his lecture by asking a question to the audience: is intelligent design a scientific theory?